Head of the Public-Private Partnerships Division at DCAF. 1 The Toolkit can be accessed at http://www.securityhumanrightshub.org/content/toolkit (accessed 30 July 2015). 2 The Knowledge Hub can be accessed at http://www.securityhumanrightshub.org (accessed 30 July 2015). 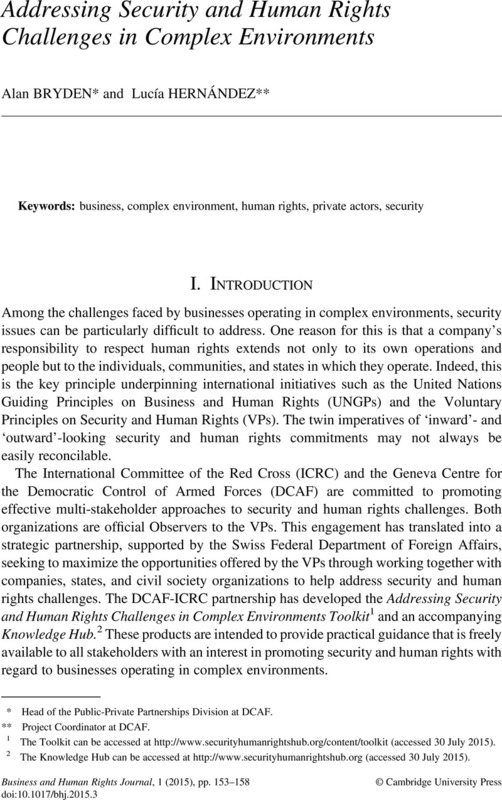 3 As reflected by the three chapters of the Addressing Security and Human Rights Challenges in Complex Environments Toolkit. 4 Since little guidance on how to conduct this process is publicly available, DCAF and the ICRC are working with IPIECA, the global oil and gas industry association for environmental and social issues, to jointly develop templates and other practical tools that can support responsible security practices by companies engaging with host governments. 5 ‘Case Study: Engagement with public security forces in Rumaila – Iraq’, http://www.securityhumanrightshub.org/content/case-studies (accessed 30 July 2015). 6 DCAF, Rapport de la Conférence régionale en Afrique francophone et lusophone, Geneva, 2015, 23. 7 ‘Case Study: Human Rights Training – Cameroon’, http://www.securityhumanrightshub.org/content/case-studies (accessed 30 July 2015). 8 ‘Case Study: Monthly Security and Human Rights Meetings in Lubumbashi’, http://www.securityhumanrightshub.org/content/case-studies (accessed 30 July 2015). 9 If you are interested in engaging with the DCAF-ICRC project, please contact PPPs@dcaf.ch. * Head of the Public-Private Partnerships Division at DCAF. ** Project Coordinator at DCAF.